A look at some of the latest activity in the software-defined WAN space. If you don't already think software-defined WAN (SD-WAN) technology is hot, you likely will when you get done reading this. Consider a recent IDC forecast that predicts the SD-WAN market will see a compound annual growth rate of 69.6% and reach a value of $8 billion in 2021, rapid growth it attributes to the technology's ability to address "pressing enterprise networking needs." Digital transformation is a significant driver, as such initiatives include adoption of cloud, big data and analytics, mobility, and social tools -- all of which contribute to growing network workloads and elevates the network's importance in maintaining business operations. The rising popularity of SaaS applications is also fueling the replacement of MPLS-based WAN connectivity to branch networks, with businesses increasingly turning to SD-WAN not only as a viable alternative, but also as an improvement on existing strategies for providing dynamic connectivity optimization and path selection in a policy-driven, centrally manageable distributed network architecture, the report states. As discussed in other No Jitter coverage, SD-WAN technology abstracts the network into software, enabling the automation of network deployment and management to expand the reach of an enterprise's private lines across the wide area. SD-WAN benefits are broad: cost-effective delivery of business apps, optimization of UC&C and other cloud-based services, improvement of branch-IT efficiency through automation, and the ability to meet evolving operational requirements of branch sites, IDC said. "SD-WAN is not a solution in search of a problem," said Rohit Mehra, VP, Network Infrastructure, at IDC, in a prepared statement. Rather, SD-WAN addresses shortcomings of traditional WANs as well as hybrid WANs, which are wide area networks that sends traffic over two or more connection types. "Traditional WANs were not architected for the cloud and are also poorly suited to the security requirements associated with distributed and cloud-based applications. And, while hybrid WAN emerged to meet some of these next-generation connectivity challenges, SD-WAN builds on hybrid WAN to offer a more complete solution." This "new paradigm in WAN architectures," as IDC calls it, is generating a significant amount of market activity as SD-WAN vendors and service providers vie for the enterprise's attention. Here's a look at some of the recent moves in SD-WAN. Aerohive, well known for its wireless access points, LAN, and cloud management solutions, has been offering a software-defined LAN solution for the past year or so. Now it's taking its software-defined networking expertise and moving into the WAN adjacency. Aerohive's SD-WAN solution incorporates five major components: intelligent path selection, application optimization, identity-based security, unified management, and link quality monitoring. By way of differentiation, Aerohive says it is the first SD-WAN vendor to offer network traffic optimization not only by application but also based on an individual user or user group. This is a capability Aerohive customers have found especially valuable in its LAN solutions, Abby Strong, VP of product at Aerohive, told me in a briefing. Among many use cases for this sort of functionality, the one that frequently bubbles up is in companies with a large number of branch locations. "It's a pipe dream to assume they are all cookie cutter deployments. It's not realistic, so you need to manage based on [user] exceptions," Strong said. With Aerohive SD-WAN, admins can set policies for routing traffic from an office in a particular way. For example, if your branch office doesn't have access to affordable DSL, you might put in place a policy that dictates that traffic coming from users at this location link to the MPLS network rather than the Internet. In other words, you set a top-level policy and manage by exceptions, whether those exceptions be for certain applications, a particular branch office, group of users, or individual user. VeloCloud enters December having had quite a news-heavy month in November -- VMware's announced intent to purchase the company; word out of Frost & Sullivan that its holds the leading market position, with a 29.5% share; and introduction of a network automation scheme it calls Outcome-Driven Networking. 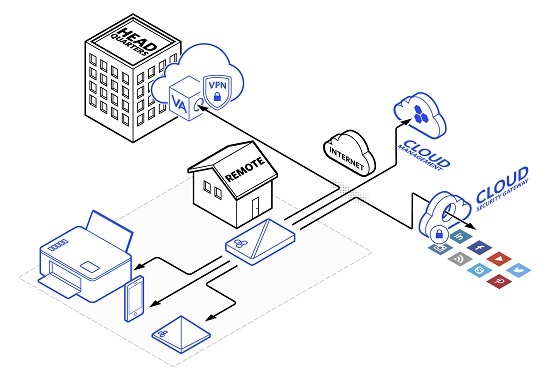 VeloCloud Outcome-Driven Networking uses the fundamentals of SD-WAN to orchestrate and automate network processes end to end. The goal is to reduce manual, time-consuming tasks so that IT has more time to focus on driving business and technology outcomes, said Mike Wood, VeloCloud VP of marketing, in explaining the goal of Outcome-Driven Networking during a No Jitter briefing. As an example of a desired outcome, Wood said an enterprise might want to improve voice quality for call centers. Traditionally, this would mean an IT manager would have to determine link performance, assign critical voice traffic to the right links, and set up complex policy-based routing configurations and multiple quality-of-service (QoS) parameters, for example. But with Outcome-Driven Networking, which is self-learning, they would simply assign priorities in the VeloCloud Orchestrator dashboard. The VeloCloud SD-WAN would constantly check degradation and quality issues on links throughout the enterprise's on-premises and cloud environments, and make routing adjustments accordingly to keep voice quality at desired levels. Separately, VeloCloud announced last week that VeloCloud Edge is now available on AWS Marketplace, combining AWS flexibility with SD-WAN simplicity. Enterprise customers can now include Amazon Virtual Private Cloud as part of the VPN. Masergy just this week announced a series of updates to its Managed SD-WAN Go service with the aim of improving application performance and security. The service now includes sophisticated application routing and automatic path control in addition to an embedded advanced firewall and router. Managed SD-WAN Go is optimized for hybrid SD-WAN deployments at businesses of any size. "Innovations in virtualization and automation are essential to the future of enterprise networking," said Masergy CEO Chris MacFarland, in a prepared statement. "By empowering organizations with networks that are agile as the cloud, they can innovate more rapidly and achieve maximum ROI as they pursue profits and growth." Not all SD-WAN activity is about products announcements. In early December, Aryaka announced that it's hired Mike Hoffman as its chief revenue officer and SVP of global sales. Hoffman, who comes to Aryaka from Big Switch Networks and Gigamon, will build out Aryaka's channel focus in preparation for an IPO next year, the company said. Also interesting to note, while Frost & Sullivan puts VeloCloud at the top of the market, a separate study from IHS Markit recognizes Aryaka as a top SD-WAN provider with an 18% share of the global market. Also in early December, provider Silver Peak announced it surpassed 600 customer deployments of its Unity EdgeConnect SD-WAN solution, which centralizes management of network functions, SD-WAN, routing, WAN optimization, and security. Counted among these customers are A. Zahner Company, Centurion Medical Products, CorTrust Bank, and EMC Insurance, the company said. Learn more about SD-WAN at Enterprise Connect 2018, March 12 to 15, in Orlando, Fla. Register now using the code NOJITTER to save an additional $200 off the Advance Rate or get a free Expo Plus pass. Beth Schultz, No Jitter editor, contributed to this piece.